Lets start the week with some cake! The other day I was a guest at a radio show where we talked about the usual things that I tend to visit various shows for, but also had some chit chat on different things, one of them being food. But I can't really asnwer the question of weather I cook or not correctly. Perhaps a boring 'sometimes' is the right answer. Most of the time I just make what I can get away with quickly (and, as you may recall, due to how I work I most often buy something fast that I have in my car...sniff). But sometimes I do cook properly, and mainly tend to bake things. And I have a habit of not really following recipes, but rather get inspired by them, and often coming up with things myself. 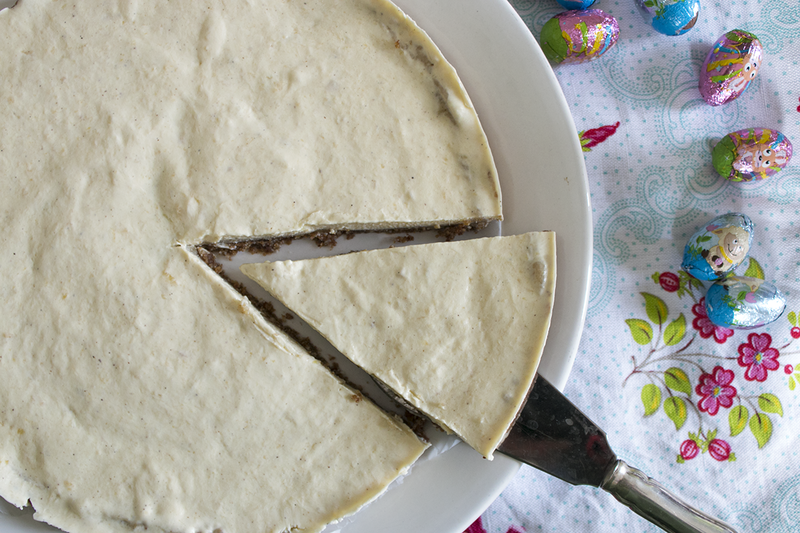 So - here is a semi-raw, no-bake, vegan and gluten free cheesecake without white sugar that I put together for Easter. Ok, I know the above categories will make some go "blah" but for me the thing with making these "free of"-cakes is that they should be as yummy and sweet-tooth soothing as any so called conventional cake, and not a substitute. Plus, if it's breakfast worthy it's a bonus because, reaaaally, who would not want to have cake for breakfast? The crust on this one is made with less nuts than usual for some variation, by using roasted buckwheat instead. I am normally not too fond of the taste of buckwheat, but when roasted it has pleasant taste and makes the crust more piquant. 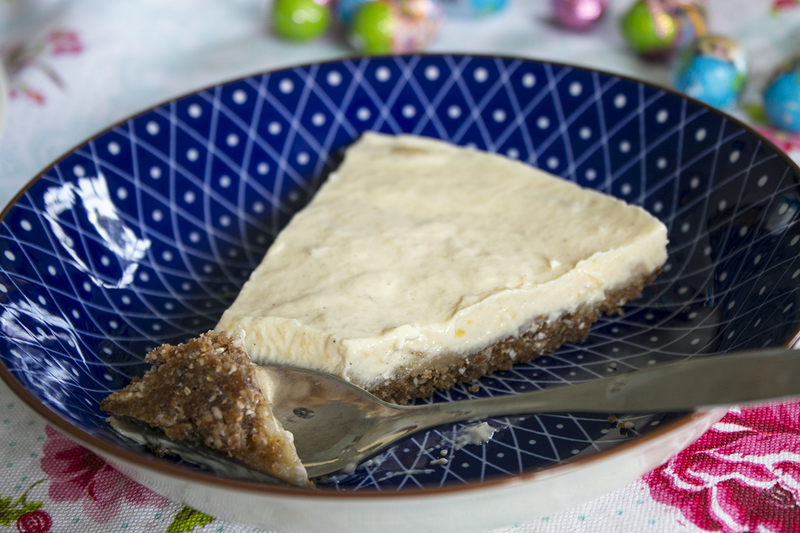 The cake has a lemond curd-y layer in the middle, and a fruity cheese layer on top made with fabulous oat-based P�Mackan cream cheese. (It's a great product; tastes just like the real thing!) If nuts are an issue you could try leave them out and use only sunflower seeds for the crust instead (in which case you might have to leave out the mid layer which is made mainly from cashews, or then make a lemon paste of something else). If this does not have to be vegan you can of course make the cheese out of regular Philadelpia or similar. If the mango is very sweet itself you might not need any extra sweetener, depending on your preferences. I used some agave syrup. Coconut oil is used to firm the cheese filling, but sometimes I have made fillings using cocoa butter instead (but that is way more expensive and not something I have at home regularly). The cake mold I use is 22cm, alas, if you want a higher creation then use a smaller mold. Dry-roast the buckwheat in a pan on mid-to high heat. Be careful not to burn them; move them around. Put the buckwheat (I keep writing buckwhat. Like buck-WHAT? Haha) in the kitchen mixer and mix, adding first walnuts about a dl at a time and then the seeds, until you have a semi smooth texture. It's okay to leave a bit of crunch. Add the dates (squeeze out excess water if you had them soaked) and mix, then the lemon zest and the oil. Press into a cake mold and put in the fridge while doing the rest. Next step! Mix the cashews smooth, add the lemon juice, the vanilla, and a bit of sweetener. You will get a rather firm paste. Spread/press it out on the crust and put back into the fridge. Time for the cheese filling! 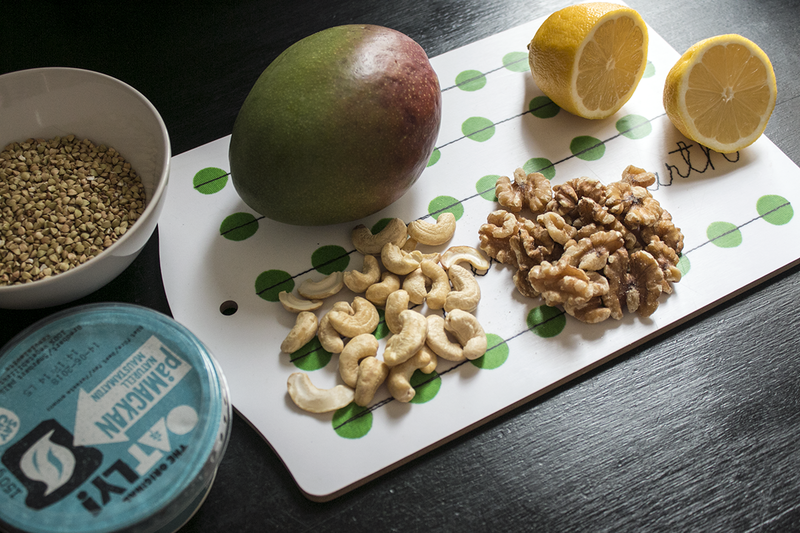 Mash the mango and mix it smooth with the cream cheese. Add the rest. Pour the filling on the cake and put in the fridge for an hour or two (or freezer, if you want it quicker. Also, some decoration would porpably be nice, but I never got that far. Berries would be a good suggestion!). Then serve and enjoy! Store in a sealed box if you don't eat all at once.